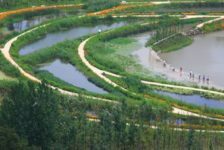 Article by Win Phyo Here’s a list of 10 projects that put sustainability at the forefront of Landscape Architecture. “Sustainability” — boy, have we heard this word a lot over the past 10 years! But it is more than just a buzzword. 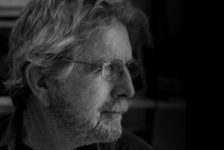 In fact, the issues surrounding sustainability have provided more opportunities for landscape architects to lead the way toward finding holistic solutions that architects and engineers might not necessarily be able to provide. 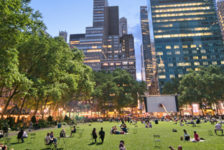 Basically speaking, landscape architects have the ability to see the bigger picture and understand the complex relationships among our cities, the people, and the natural environment. To demonstrate this, Tania Gianone has given us 10 practices that show how “sustainability” has made the world a better place — and almost all of these practices have a landscape architect playing a major role. 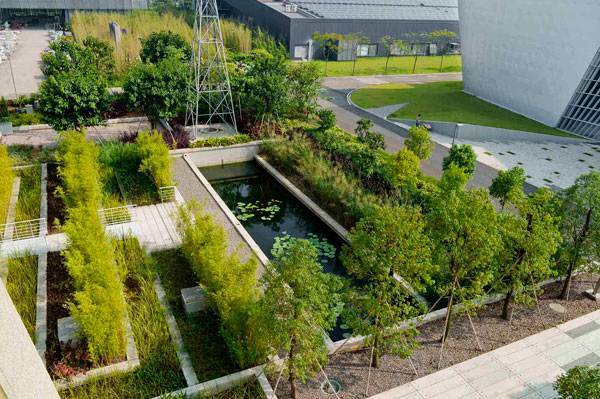 Let us take a look at the 10 most inspiring, functional, and successful landscape designs that have really sought to make our environment more sustainable. 10. Atlantic Wharf Park, by Halvorson Design Partnership Atlantic Wharf Park answers the prayers to revive a historical, lively district in Boston, Massachussetts, with clean and functional design solutions. One key aspect of this design was the preservation of the historical buildings relating to America’s colonial times. Forty-two percent of the existing historic structures were re-used, through refurbishment and integration with the modern elements. 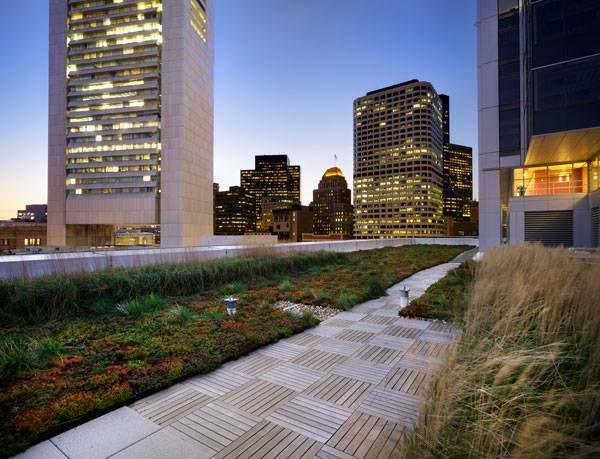 Another great feature of this design was increasing the green spaces within the area through the addition of extensive green roofs. In fact, the water efficiency of the Atlantic Wharf Park building is also combined with the reduction in irrigation costs through rainwater reuse and the planting of native vegetation. 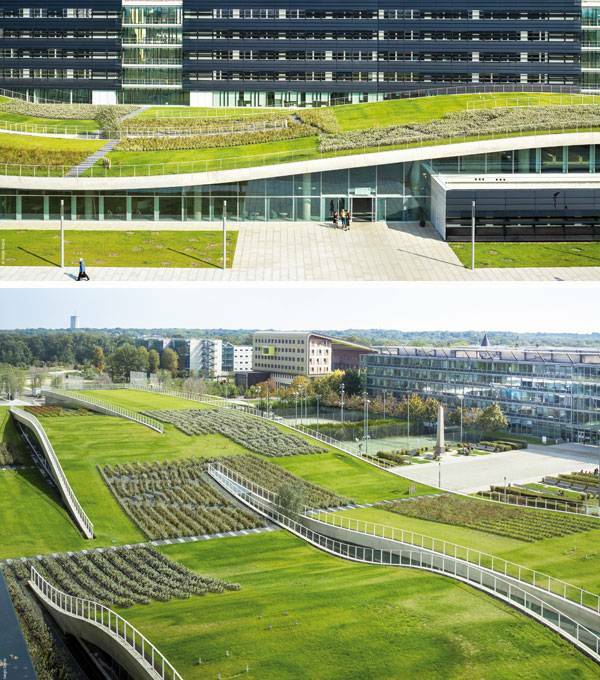 Interestingly, this green roof in particular uses pre-planted modules that also allow for easy access and repair. 9. Vanke Research Centre, by Z+T Studio Shenzhen, China, was once a hilly region with fertile lands, but urbanization has created a growing, modern cityscape. The Vanke Research Centre evolved through this significant change of the land and is a testing ground for sustainable projects. The main goals of the project revolve around ecologically sensitive solutions toward containing and purifying stormwater and recovering native habitats. The result is an exciting series of spaces that allow opportunities to firstly control stormwater runoff, then to purify it. Since it is a testing ground, there are multiple materials used to test their functionality for optimal results. 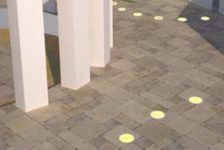 For example, examining the use of turfs vs. bushes to control the flow rate of stormwater or testing out different pervious materials such as bark, ceramics, sand, etc. 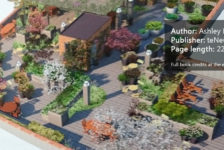 This is truly an exciting project, and the most exciting aspect lies in the two overarching spaces of a “ripple garden,” which controls the runoff, and a “windmill garden” that enhances the runoff quality. 8. Royal Neighbour, by Mandaworks Even before the 1992 Global Environmental Conference in Rio de Janeiro, there was a 1972 United Nations Conference on the Human Environment in Stockholm, Sweden. Royal Neighbour is one of the major sustainable developments to have occurred in the city of Stockholm since that time. The 18-hectare project is full of bold ideas and when finished will consist of three new neighborhoods with distinct characteristics, seeking to meet the six priorities stated in the city’s Environment Program: environmentally efficient transportation, goods and buildings free of dangerous substances, sustainable energy use, sensitive use of land and water, waste treatment, and healthy indoor environment. How do all of these aspects come together? Well, we will have to wait, as this exciting project won’t be complete until 2030! 7. 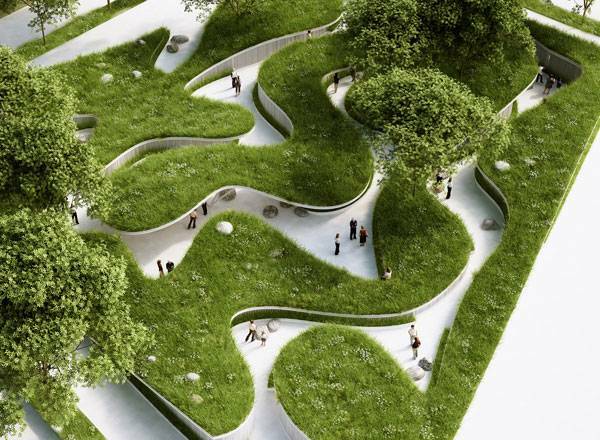 Where the River Runs, by PENDA This project was a part of the 10th China International Garden Expo. This project created a big shift in bringing China onto the sustainability ladder with the rest of the world, and its focus was to bring to realization the importance of clean water for the environment and for our health. It is, in effect, a truly great example of raising awareness among people. When they walk through the plot, the paths make people feel as though they themselves are the river. By encouraging them to plant the seeds given to them at certain borders of the plot, they will see the importance of their contribution toward the environment as the seeds sprout during the exhibition period. Underground tanks also collect and store rainwater for irrigation purposes. 6. 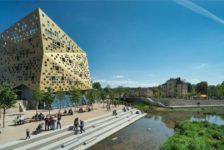 The Science and Technical Pole, by Jean-Philippe Pargade This project, located within a 20-minute drive of Paris, was built as a sustainable campus for education, research, and engineering. 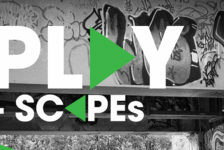 Social, economic, and ecological challenges around this project were addressed, but what is unique about this project is that it not only addresses these on a site-specific scale, but also seeks to integrate existing cities and communities. The project uses bioclimatic design — which essentially is the creation of a harmonious design of buildings and spaces, indoors and out — based on the local climate, making use of solar energies and other environmental sources. 5. Burj Khalifa Tower Park, by SWA Group Dubai’s desert climate has extremely hot temperatures, strong winds, and high humidity during the summer. These unfavorable conditions meant that SWA Group had to be highly resourceful to not only create a functional design, but one that is aesthetically beautiful and striking enough to meet the country’s high standards for development. The resulting series of open spaces to complement Dubai’s tallest skyscraper was certainly not a disappointment. 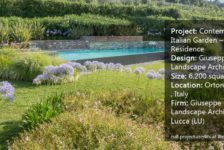 Major innovations of the project include using native planting and colorful tiles to complement the short flowering season. 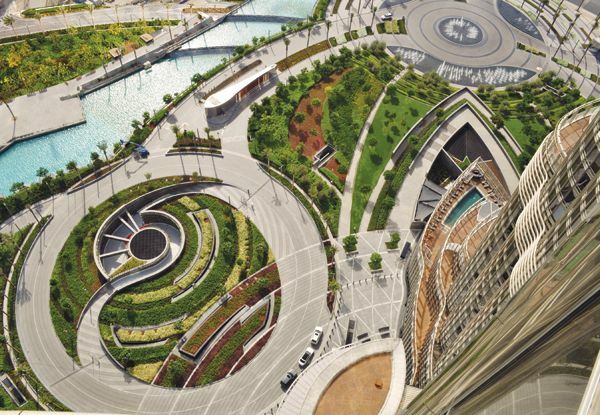 Six major water features are made possible by an irrigation system that collects, drains, and pumps condensed water from the humid outside air through a chilled water-cooling system from the tower. That system produces 15 million gallons of water annually, some of which is used in the irrigation of the plants! Burj Khalifa Tower Park; credit: Tom Fox and SWA Group. 4. 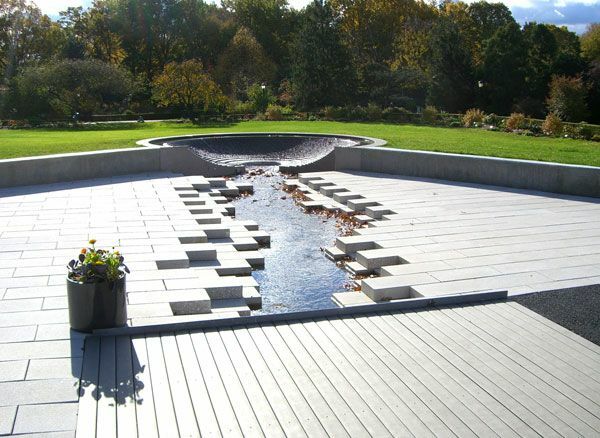 Queens Botanical Gardens, by Atelier Dreiseitl This elegant design in Queens, New York, has given the borough’s population the opportunity to interact with nature while putting water management at the core of the building and landscape design within the garden. All features within the garden have been led by the unifying theme of water and its circulation throughout the site, including creating bridges over the water channels that allow people to learn about how the channels function and bring the processes into plain sight. The transparency of the system is what ultimately creates the boldness of this project, serving as a great example of sustainable urban garden design. 3. 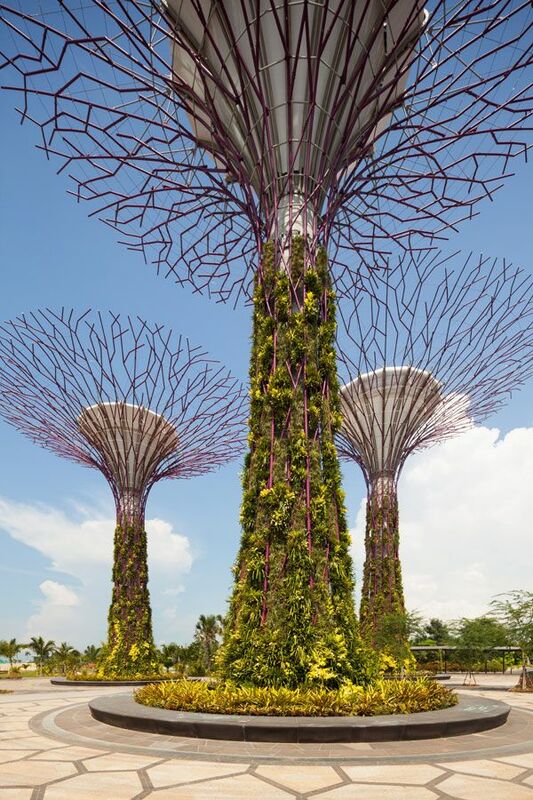 Gardens by the Bay, by Grant Associates We are all familiar with this project in Singapore, which essentially started off as a competition entry that has led to an innovative, iconic design that demonstrates sustainable artistry. The two apparent features of this project are the Supertrees and the grid shell-shaped Cooled Conservatories. These structures were indeed based on sustainable concepts, including rainwater collection and reuse, provision of shade, and fans under the walkways to produce air movement. Did you know that the geometry of the Supertrees allows them to function as pipes to remove hot air from the conservatories and increase the flow of fresh air at ground level? 2. The National Arboretum, by TCL After a wave of fires that destroyed the forests of the Australian mainland in 2003, the 250-hectare National Arboretum in Canberra commemorated the loss through the design of the four existing forests and many gardens. With sustainability at its core to prevent the loss of habitats and the extinction of species, each forest uses a simple, geometrical language and contains 200 to 3,000 trees. 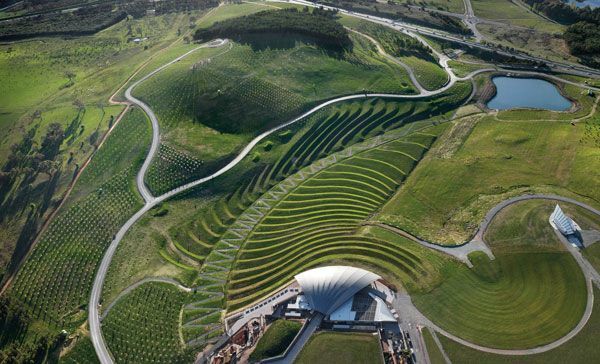 The pathways do not interfere with the planting or the natural landform, and the design uses an environmentally friendly irrigation system to supply water to all the plants within the arboretum. 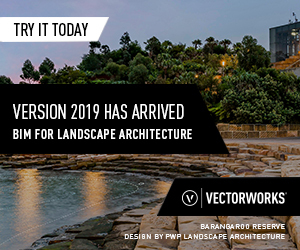 Aesthetics came second with this project, and some of the features include a series of sculptures that will over time be discovered within the forest landscape, picnic areas, and the imaginative Pod Playground, which resembles acorns. 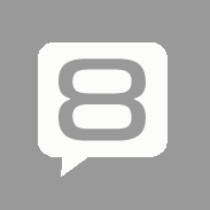 This project has huge potential to develop over time and its possibilities are unlimited. Its importance cannot be underestimated, and hence the arboretum can be described as a gift for future generations. 1. 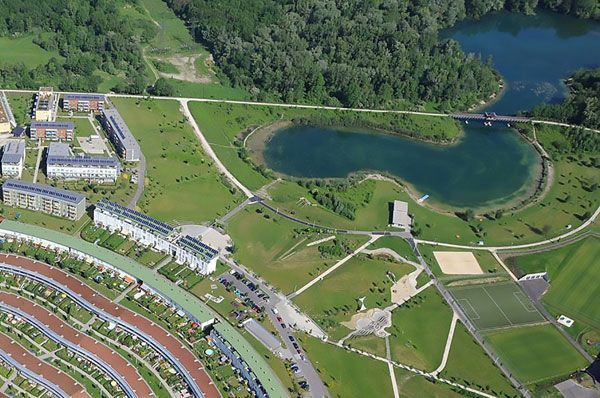 Solar City, by Atelier Dreiseitl The Solar City Project in Austria was an attempt to bridge the social, environmental, and social perspectives of sustainability at a time when the subject reached its peak in the 1990s. It came about from a need to expand due to population increase. This project is truly integrative and respects the sensitive surrounding riparian landscape while attending to the recreational needs of the residents. From the beginning, Solar City aimed to embrace high-quality architecture and ecological quality. 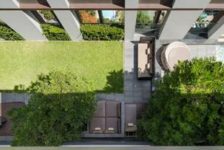 As a result, the mission for the landscape architects was to ensure the design for the residential areas would not harm the protected natural areas. A natural swimming pond, manmade wetlands, and water management systems are just a few of the features within this scheme. A decentralized wastewater purification system was also set up for 88 homes and a primary school, where the waste matter was used as compost and fertilizer!